Sqlite Reader Software previews data in four categories I.e. Unallocated, Deleted, Active & Secured using Color Scheme. The Sqlite database viewer freeware not only offers a thorough yet quick scanning of the database file. But it also recovers corrupt sqlite database items before loading them on the UI for preview. Thus, you can work on the software with both; corrupt as well as healthy SQLite files. Once the SQLite file has been scanned you can preview all its components successfully in the preview panel. The components that are supported include; tables, indexes, views, triggers, and columns. Any sort of limitation regarding the database file size is not imposed by the free Sqlite Viewer software. A database file having both; a size in Gigabyte or size in Terabyte, can easily be scanned by the software equally. The free Sqlite Viewer software works for the scan and view of multiple database file types. The support is provided for file types like; *.db, *.sqlite, *.db3, *.sqlite3 extensions that belong to a variety of platforms like; Sqlite, Skype, etc. To easily distinguish the data in SQLite database file, SysTools Sqlite database viewer sort the SQLite data in four categories i.e. Unallocated, Deleted, Active, Secured. Each category has a unique color scheme to differentiate SQLite data. 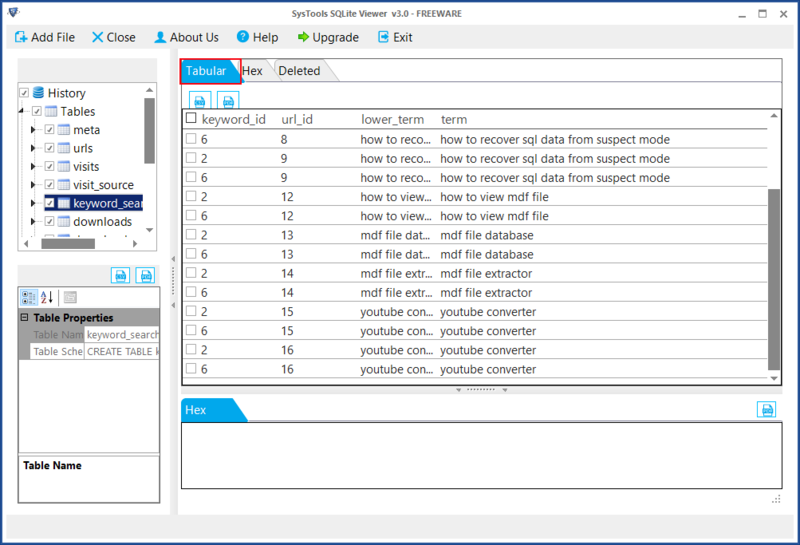 Sqlite forensics explorer allow you to add multiple .sqlite files data in single pane. This allow you to view and compare the data between multiple database files of SQLite database. SQLite uses journal files to temporary hold the database. The Sqlite database browser forensically investigate and previews the detail from Journal file associated with SQLite database. 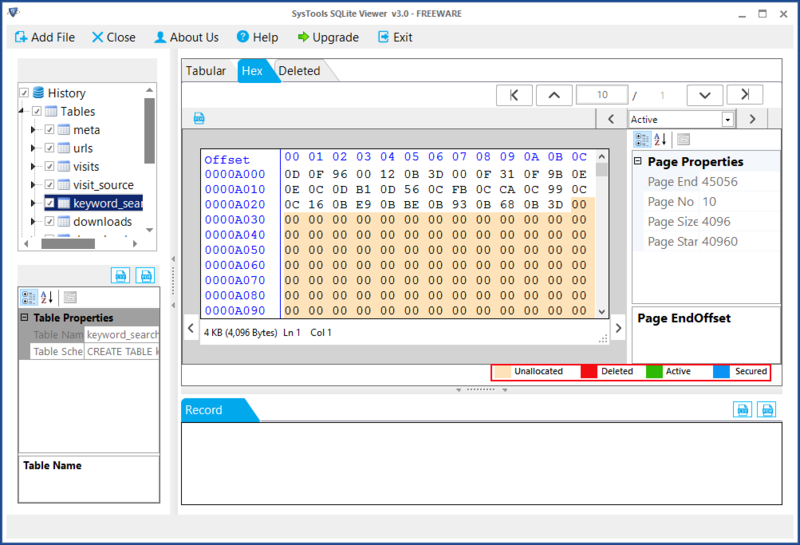 The Sqlite forensics explorer not only provides an option to view data in tabular form, It also enables you to analyze the database items in HEX view format and examine the page properties like Page EndOffset, Page No, Page Size etc. The Sqlite reader software allow you to view deleted data of SQlite database. The software enables a separte tab to analyze deleted records of a SQlite database file more efficiently. 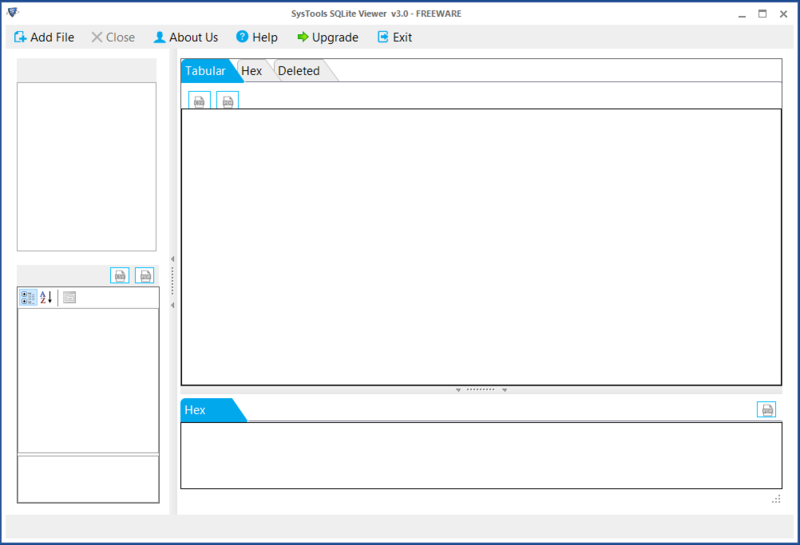 How to View SQLite Database using Sqlite Forensics Explorer? Yes, Sqlite database viewer is capable to support .db files created in android smart phones. Software Will scan and preview the content of selected files. Can I view SQLite files of the older version & SQLite Engine supported files too ? Yes, you can view all the versions of SQLite Database Engine files in our free Sqlite database viewer. The file format that are supported by our tool to view SQLite files are: *.db, *.db3, *.sqlite, *.sqlite3. Is it possible to export an SQLite database file to a different file type ? 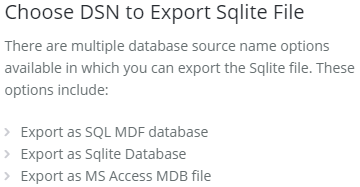 Yes, the Pro version of the software allows exporting SQLite database into; Access Database (MDB), SQL, & Sqlite. 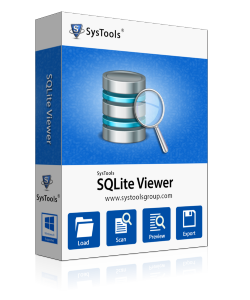 You need to purchase the licensed version of the Sqlite database viewer to export. Can I look for a specific component from a heavy SQLite database file ? Yes, the free Sqlite database viewer comes with a search box. Use a specific keyword / phrase that is relevant to what you are looking for & proceed. All the matching results will get listed. Is there an option in the tool to sort a database according to fields ? Yes, our free Sqlite/3 viewer not only views the database (Table, Views, Triggers, etc.) but also provides a sorting option. By clicking on an individual field, you can sort your database accordingly. Can I view corrupt SQLite database using this free Sqlite viewer ? Yes, you can view corrupt database components too. The tool has an inbuilt scanning option, it reads & scans the database internally, line by line, & accumulates the distorted line to show the free preview of the repaired SQLite database. Is there any file size limitation enforced to view SQLite database? No, there is no such kind of limitation. The software is tested under rigorous conditions. Even a corrupt database of 1 Terabyte size is loaded and previewed successfully with the help of software. Note: Software will get delivered on your registered email id, within few minutes after placing the order. Electronic Delivery: The delivery of product is automated. You will receive an email containing both the link to download the product and the activation key within few minutes after payment confirmation. Of all the software programs that we came across while searching for a viewer were available only via purchase. Thankfully, this software from SysTools is not just exactly what we need, but also given out for free. Sqlite database viewing is now so much easier! What we were looking for a tool that could just give us a preview of the Sqlite database files. But, along with that, we also expected it to be capable enough handle heavy database files and offer a search option to sort out particular data out of all. Thanks to SysTools, we got what we needed for no cost at all!